LITVA'S Jewelry is a blend of eclectic and bohemian pieces for an effortlessly chic look. Sandra is the brain and the artist behind LITVA'S Jewelry. Her brand vision is all about celebrating women who are unique and confident. Creating beautiful jewelry is a lifelong passion of Sandra’s. She loves color, using a variety of materials to create both minimalist and bolder statement pieces. Sandra manages everything to do with her business, from inventory, distribution, to customer service, marketing and sales. So that she can spend more time on her vision and creations, she uses Marsello to take care of her marketing. The LITVA'S Jewelry loyalty program is well balanced to both celebrate her customers and encourage them to shop again. Customers are awarded points for every purchase and also if they show loyalty in other ways, such as sharing on Facebook, leaving a product review, completing their profile and more. Sandra has created a variety of rewards that get her customers excited to redeem them. From $ and % off rewards to free products, customers can choose to use their reward coupon on the product that’s caught their eye or get introduced to a new product they may not have brought before. Sandra values all of her customers and even shows a little extra bit of love to her best customers. She's introduced a 3-tiered VIP program which rewards their customers at different point levels depending on their loyalty. To further celebrate her best customers, Sandra has created an exclusive email flow to customers who have spent over $1000 at her store. This email includes personalized product recommendations that customers will most likely purchase, an exclusive discount, and a personal message from Sandra herself. Sandra is passionate about creating timeless pieces that their customers love. When a visitor adds an item to their cart and hasn’t completed their purchase, it triggers LITVA'S Jewelry's abandoned cart email flow. These emails include an image of the pieces reminding them of the beautiful pieces they’ve left behind and lead them back to their shopping cart. 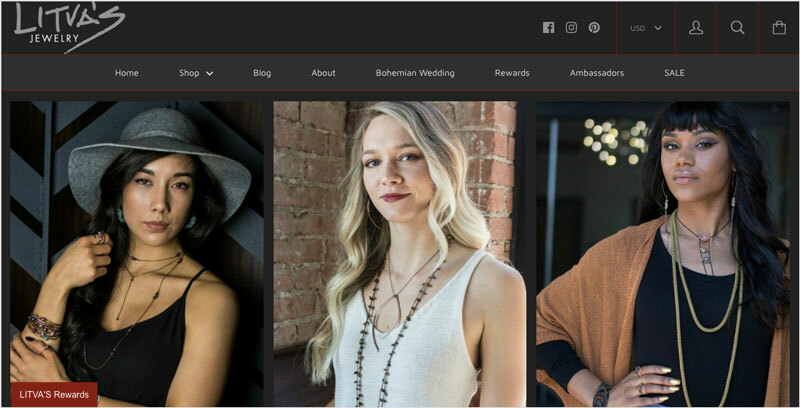 LITVA'S Jewelry is a statement brand that represents their eclectic and bohemian style, and Sandra has gone the extra mile to ensure customers get a consistent brand experience across everything. Her Marsello marketing is no exception; her logo, colors, media and personalized text help her customers instantly recognize the LITVA'S Jewelry brand, making it feel like an extension of her online store. #MailboxMonday is a Youtube playlist hosted by @agapelovegirl. She has a passion for beauty products and shares it through fun and interactive videos. LITVA'S Jewelry have been featured many times throughout the weekly series. In episode #63, she raves about her new LITVA'S Jewelry statement ring that she’d recently received. Her enthusiasm when describing how each piece is handmade by Sandra with the utmost care and product quality is very motivating for viewers. At the bottom of all her videos, she shares a link showing her followers exactly where she can purchase their own.